Supports login with any 3rd party OAuth server or custom OAuth server. Optionally Auto Register Users- Automatic user registration after login if the user is not already registered with your site. Attribute Mapping- Basic Attribute Mapping feature to map Joomla user attributes like Username and email. Manage username & email with data provided. Auto Create new users in standard, premium and enterprise versions of the plugin. Role Mapping- Assign roles to users registering through OAuth Login based on rules you define (Premium Feature). OAuth Provider Support- It Supports only one OAuth Provider (Enterprise Version : Supports Multiple OAuth Provider). Redirect URL after Login and Logout- Automatically Redirect user to desired URL after successful login and logout. Use the Force Authentication feature to restrict access to your website to only logged in users. Domain Specific Registration - Restrict users having specific domain names from logging in. Restict selected pages to logged in users (Enterprise). Generate and view User login report (Enterprise). Choose miniOrange Joomla plugin file to install. In the Joomla admin interface, go to Extensions > Manage > Manage. Here you can enable and disable Joomla plugins and edit plugin details and options. It is also useful for quickly enabling or disabling multiple plugins at the same time. Go to Components > miniOrange OAuth Client > Configure OAuth. Select an application and scroll down for setup instructions. Save the settings and then run the test configuration to get attribute mapping info. Then fill out the Attribute Mapping form below OAuth Configuration. Add a button on your site login page with the URL given on plugin's configuration page (below Attribute Mapping). When you click on the link you will be redirected to your OAuth Server's login page. 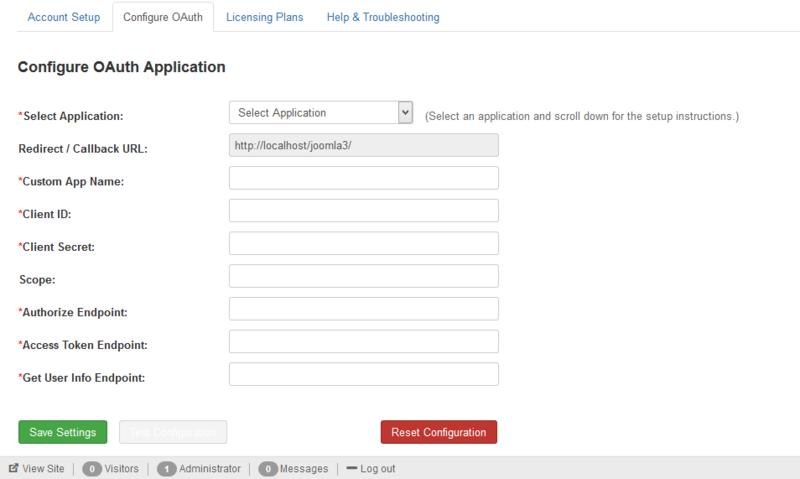 Login to your OAuth Server with username / password. Once you are authenticated, you will be logged in to joomla site. If you don't find what you are looking for, please contact us at info@miniorange.com or call us at +1 978 658 9387 to find an answer to your question about Joomla OAuth Client.